Richard Croasdale drops in on Buxton Brewery, the Peak District gem that’s more about action than words. When you visit a brewery in a village like Buxton, it’s hard not to carry certain preconceptions. This leafy, secluded idyll, nestled in a valley and surrounded on three sides by the Peak District National Park is a picture postcard of northern rural life. Stepping off the train (it only goes to Manchester) and heading down the hill past traditional pubs and antique shops, one can almost hear the music from the Hovis advert playing in the background. It’s the whole package. But then you walk through the door of the Buxton Brewery taproom, and the scene takes an unexpected turn. On the shelves behind the bar are rows of beers on which Buxton has collaborated with the likes of Omnipollo, Evil Twin, Stillwater Artisanal and To Øl. There are bottles of Yellowbelly, dressed provocatively in tiny Klu Klux Klan robes. On the bar top sits a slushy machine, inexorably churning a vat of semifreddo ice cream beer. For anyone not already familiar with Buxton’s reputation, this may come as something of a shock. Buxton may go against the industry norms when it comes to blowing its own trumpet but that’s not for a lack of innovation, quality, or achievement. Since it opened its doors in January 2009, this relatively small local brewery – led by the softly spoken Geoff Quinn and his long-serving team – has consistently been ranked among the top breweries in the world, attracted global beer rockstars to its sleepy rural home and led where more demonstrative breweries have scarcely dared to follow. 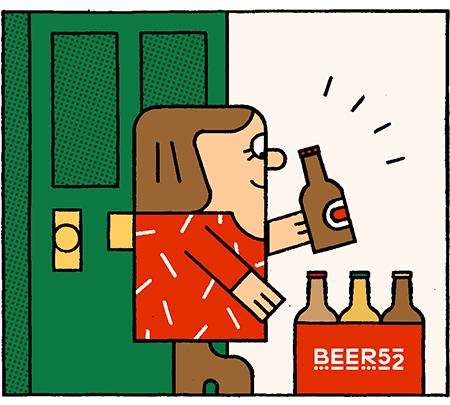 Ironically of course, Buxton’s lack of interest in hype – which has inevitably led to new beers or entire new lines being dropped onto the market with no warning – has in the past created a buzz of its own. For example, its range of six Belgian beers was developed in secret for several years, before being launched with a borderline taciturn ‘now available’ tweet, sending fans and bloggers into a frenzy. But Geoff’s philosophy of organic growth has always been borne out in the way Buxton conducts itself. Starting out as a cask-only brewery, it began dealing directly with a handful of local pubs and gradually worked its way outward, eventually moving to keg, introducing a bottling line and expanding its distribution to London and Edinburgh. Despite its significant success with critics and ordinary beer lovers alike, the team fluctuates between just nine and ten, and not much has changed in terms of the brewing process. Buxton undoubtedly has some great crowd pleasers in its line-up (though it doesn’t really talk about ‘core’ beers) including Axe Edge, High Tor and Moor Top. However, these account for a surprisingly small percentage of it total output, the bulk of which comes from a dizzying selection of more niche experimental beers. I asked brewery manager Denis Johnstone why. “Not many breweries have a beer like Axe Edge that only makes up around 10% of their volume. With the demand, that could be 60% of our output, but we’d get bored. Demand does drive what we brew to an extent, but everything starts out with an idea for a beer we’d like to drink. So a beer like Trolltunga started off as a limited collaboration, but we now brew it once a month because people loved it.” Beer creation is a big part of what makes Buxton special and it’s a genuinely collaborative team effort. When Colin Stronge took over as head brewer in 2011, the brewery was already winning awards by the armful, but he kickstarted a new era of experimentation which continues to this day. Where some experimental breweries can end up alienating drinkers though, Buxton seems to have a knack for being one step ahead of the next beer trends. For example, it’s been making excellent fruit sours for around four years now, it has a well-established barrel-ageing programme, and its (at the time) ground-breaking dry-hopped Berliner Weisse is today one of many on the shelves of the UK’s bottleshops. One recent successful innovation came out of a collaboration with Swedish megastars Omnipollo. The two breweries were originally paired as part of Siren’s Rainbow Project (for which they produced the wildly popular Yellowbelly), but the two teams got on so well that the partnership has continued. Their latest joint hit is a series of ice cream beers, which seek to mimic desserts in flavour, aroma and mouth feel. Denis says they have caused problems at festivals (“yes, you’ve said it’s an ice cream beer, but what style is it?”) but that other breweries are now picking up the baton and producing their own interpretations. “Producing a twist on an existing style is great, but it’s not often you can say you’ve created something completely original. That’s one of the reasons I think we get on so well with Omnipollo – when we get an idea we’ll keep looking for new ways to achieve it until we find something that works,” he says. Part of the reason for the sheer number of beers that Buxton has on the go at any given time (it now has around 40 that are still considered ‘current’) is its cask heritage. Phoning round the pubs in the brewery’s early days, Denis says that many would order “one of everything you’ve got” knowing he would have to make a journey. As this would be the case whether they were offering two different beers or ten, it made sense to have ten. This has remained part of Buxton’s culture, and suits its spirit of creativity and innovation. While Buxton is now well known in the craft beer community – not just in the UK but around the world – it still has a strong sense of place. One of its most important developments in recent years was the opening of the Buxton Brewery Tap in the town centre. Originally conceived as a place to take visiting brewers, the tap has become a real hub for the community, serving food and wine (though not macro-brewed lagers, ever) to a diverse crowd of families, students and beer geeks. Denis says it’s helped cement the brewery’s place in the hearts of the locals, and put Buxton on the craft beer map. Of course, this level of attention inevitably means growth has come to Buxton, even if Geoff has not actively sought it (and he’s definitely not churlish about that). When the brewery first moved into its current home it only had five fermenters; this doubled around two years ago, though this was mainly for increased flexibility and the brewery’s output remained roughly the same. More recently, five huge double-height fermenters have been added outside, effectively tripling Buxton’s production capacity. The brewery building is also seeing further improvements, with a new grain silo, staff facilities and – perhaps most excitingly – a new tasting room overlooking the brewhouse floor. Though it was only the shell of a bar and some reclaimed wooden tables when I visited, the finished space will have a similar feel to the Tap, with the added advantage of being right in the middle of the brewing action. From the cheerful staff to the huge racks of barrels (they take up valuable space in the small brewery, but they clearly make Geoff happy and produce great beer) the fruits of Buxton’s integrity are everywhere to be seen. In a craft beer world that sometimes confuses style with substance, it’s great to see a brewery making truly innovative beers without too much arm-waving.